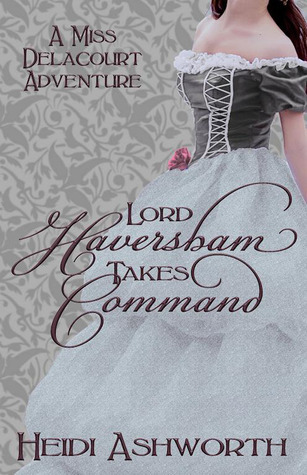 Lord Haversham is the fourth installment in the Miss Delacourt Adventures series written by Heidi Ashworth. For more information on the book head to it’s Goodreads page. Lord Haversham feels as if he is always running, first from Lord and Lady Avery, his foolish parents, then from the consequences of a schoolboy prank gone awry. Now a secret service agent to the young Queen Victoria, he has run back to England from traitors who seek his life. Little does he know he is running into danger of a different kind; the perceptive, sapphire-blue gaze of his childhood love, Miranda Crenshaw. How is he to win her heart without giving away his secret and endangering the life of the Queen? I started reading this book last night at 2:00am with the thoughts of just getting through the first few chapters. At first I thought that was going to be easier-said-than-done as the back and forth between Mira (Miranda) and her parents was a bit stiff, however, after pushing through it I found myself turning page after page to see what happened next. Before I knew it 6:00am had hit, the book was finished, and I was disappointed. I wasn’t disappointed in the book or the ending…just that it HAD ended. I wanted to keep reading more about Harry, Mira, the cumbersome George, and the little bit crazy Lady Avery. The story was great and while this is the fourth installment in a series it really is a stand-alone book as I was able to thoroughly enjoy it without having read any of the other three. That being said it doesn’t completely discount the other books as I believe there are several nods to things that have happened in the past books so people who have read those will be like “Ahhh I remember that!” I loved the characters in the story and was rooting for Harry to come clean about Bertie to Mira, her parents, and her brothers long before he did. My only complaint, and it is a very small one, is that I did feel that the very end was a bit rushed but that could have just been because it was the end and I didn’t actually want it to end! While I received this one to review I WILL be going back and purchasing the other three books and waiting impatiently for the next book in the series. Thanks for the review, it’s always hard to pick a book, since I want to enjoy them all! This sounds like a good one! I usually don’t read books set back in history but this one sounds like a good one! I love historical romances I don’t know why. Hi Cassie–thanks so much for the lovely review–and, might I add, I love the font for your comment box! So fun!